For the past 10 days short term chart resistance was at $268. 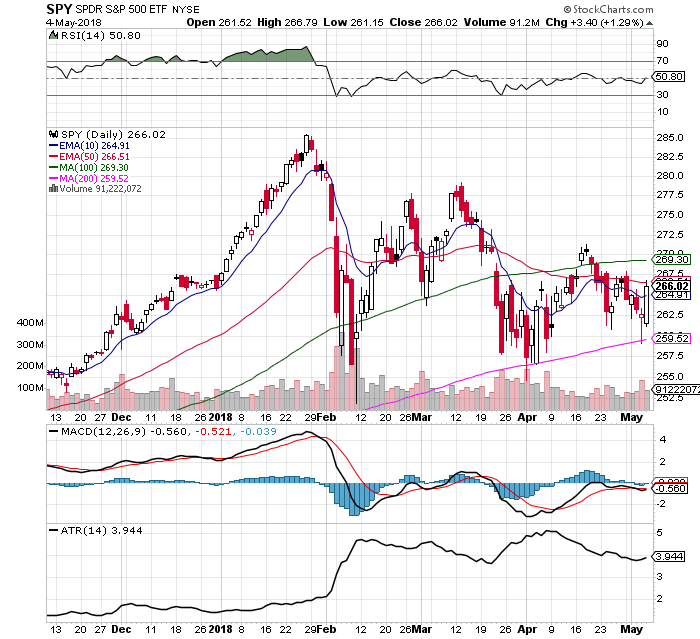 Since March 22nd the 100 day SMA has been resistance with support at the 200 day SMA. The 50 day EMA acted as resistance on Friday after the strong rally inside the range. Price remains under the 100 day SMA. The chart is under a bearish cross under. The price rallies are on lower volume and the down days are on higher volume. $VIX ended the week at 14.77 inside the recent range. RSI is bullish over the middle line at 50.80. On Thursday price lost the 200 day SMA intraday then rallied strong. Price is back over the 10 day EMA. The trading signals that are working in this range bound market is buying support and selling into rallies. When resistance is broken it will be more possible that the up trend continues. The 10 day ema crossing over the 50 day ema is another key trend signal I am looking at for a long signal.